Wastewater treatment systems and solutions experts Jacopa have won a contract to provide six of their robust packaged CB750 Copa SAF-Hire treatment units. Posco E&C, one of South Korea´s largest EPC Turnkey contractors, has awarded Cambi a contract for a Cambi B12 Thermal Hydrolysis Process plant (CambiTHP™) for the Anyang Sewage Treatment and co-digestion Project. 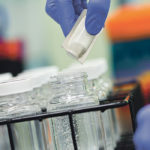 The need to quickly identify and resolve microbiological contamination in drinking water systems is well understood by water utility companies.